Anhui (安徽)Although tea is not listed as being one of Anhui’s key economic products, it is nevertheless home to Keemun (Qimen County of Huangshan City), probably China’s most popular Black tea. Anhui is also home to Huangshan Maofeng, several Yellow teas and my favorite Chinese Green, Taiping Houkui. Fujian (福建)One of the major producers of tea in China, Fujian is home to Oolong tea (Tie Kuanyin can supposedly be traced back to single plant from Anxi County), Lapsang Souchong, Wuyi and Silver Yen Zhen Pearls. Additionally, the modern tea processing techniques for Oolong, White and Black tea were developed in Fujian. Three famous “red teas” from Fujian are Tanyang Gongfu, Zhenghe Gongfu, and Bailin Gongfu. My favorite Fujian tea is Quilan Oolong from Mt. Wuyi. Guangdong (广东)Like it’s twin Guangxi, Guangdong is not necessarily known for its tea production. Nevertheless, Guangdong produces Osmanthus and many interesting Dan Congs. One tea of note from Guangdong is Ying De Hong. Guangxi (广西)The Guangxi Zhuang Autonomous Region isn’t generally known for tea so much as it is for rice production. Hubei (湖北)Along with cotton, rice and wheat, tea is considered one of Hubei’s main agricultural products. Although Hubei produces many kinds of tea that originated elsewhere, it’s probably best known for Jade Cloud, Auspicious Ayame Wulong and Yu Lu. Hunan (湖南)Tea is noted as being of Hunan’s major agricultural products. Hunan is home to Junshan Yinzhen, a Yellow tea. It’s also known for producing several more refined teas such as Mao Jian and Pai Mutan. My favorite Hunan tea is Dark Heart (Heicha), a pu-erh tuocha. Jiangsu (江苏)Tea is noted as being a main cash crop of Jiangsu. Jiangsu is noted as being home to Bi Luo Chun, White Cloud and Rain Flower, as well as the Province where the town of Yixing can be found. Although I’ve certainly tried Bi Luo Chuns, to the best of my knowledge, I have yet to review anything produced in Jiangsu apart from my Yixing teapot. Jiangxi (江西)Although tea isn’t noted as being a main agricultural product of Jiangxi, I myself have had several teas that were produced there. The most important tea growing region in Jiangxi is Wu Yuan, a county that borders Anhui and shares a dialect. Jiangxi’s most notable teas are Lu Shan Yun Wu (Clouds & Mist), Chun Mee and Gou Gu Nao. My favorite Jiangxi tea is TeaGschwendner’s China Wuyan Jasmine. Sichuan (四川)Sichuan (better known in the West as Szechwan)’s tea industry dates back at least to the Song Dynasty (960-1279 CE), when that dynastic family put a stranglehold on Sichuan tea sales to pay for their war machine. Thanks to desertification over the centuries, SIchuan has become too arid for tea production to flourish. Sichuan is best known for its Golden Monkey, Huangya Yellow buds and Zhu Ye Qing. My favorite Sichuan tea is their Pre-Chingming Meng Ding Gan Lu. Xinjiang (شىنجاڭ‎)Despite Xinjiang Uyghur Autonomous Region (the furthest North Western province of China) being traditionally considered to be an agricultural region, tea is not one of their chief products. Sitting far to the north of Sichuan and Yunnan, its geography is dominated by mountains (including K2) and deserts. The only tea I’ve ever encountered (or expect to) from Xinjiang is Tazo’s decaf lotus blossom. Xishuangbanna (西双版纳州)Hanging off the southern tip of Yunnan, entirely indistinguishable from the rest Southeast Asia (as it borders both Myanmar and Laos) the Xishuangbanna Dai Autonomous Prefecture (Xidai (西傣) for short) produces some of the most highly regarded Pu-erh. In point of fact, Xishuangbanna’s northern border sits less than 20 miles from the town of Pu’er. On the Western edge of Xishuangbanna, Menghai Tea Factory, is one of the oldest and most important producers of both Sheng (raw) and Shou (ripe) Pu-erh. Yunnan (云南)Quite simply, the birthplace of tea. Containing both Tropical and Subtropical climates, with both very wet monsoons and very dry winters, Yunnan is one of the most biodiverse places on Earth. Bordering Guangxi, Guizhou, Sichuan, Tibet, Vietnam, Laos, and Burma, Yunnan is also one of the most culturally diverse. Yunnan has six separate tea growing regions and boasts the oldest living tea tree (in Fengqing, ~3,200 years). Indeed, many tea trees in Yunnan are so old they must be climbed in order to harvest their leaves. Best known for its Pu-erh (the ancient trading post city of Pu’er (普洱市) lies in Yunnan), Yunnan also produces some very unique Greens and Blacks. Chief among them: Yunnan Gold, Fengqing Sheng Puerh, Dian Hong and Hazelberry. I honestly have no idea what my favorite Yunnan tea is–they’re all so amazing. I really enjoy TeaGschwendner’s China Yunnan Golden Downy Pekoe and Goldfish’s Loose Pu’er 2004. Zhejiang (浙江)Zhejiang leads in tea production among the provinces of Japan and is one of the most important for quality. Best known for its Longjing (better known as Dragon Well, said to be among the most prestigious Chinese tea), Zhejiang has been exporting tea since at least 1832. Zhejiang is home to Gunpowder Green as well as Anji Baicha and Hangzhou Tian Mu Qing Ding. My favorite Zhejiang is Pan Long Yin Hao, a hybrid Green. I also really want to try Jiu Qu Hong Mei if i can ever find one. Assam (অসম)Home to the second form of tea known to grow natively, Camellia sinensis assamica, Assam is also the world’s largest tea growing region (something like 400,000 square acres? said to equate the swath of land between New York and Chicago). Cultivation began in earnest in the 1830s and in short order, Assam had become so critical to world tea production it was actually given its own time zone (Bagantime or “Tea Garden Time”) by the British. In recent years, annual tea output from Assam has accounted for 1.5 million pounds. Like Darjeeling, Assam tea usually refers to their traditional Black tea, though in recently years production has branched out into Greens and Whites. Assam is reknown for its briskness, bright color and malty flavor. Assam teas are the “base” in CTC breakfast blends such as Irish Breakfast. Darjeeling (दार्जिलिङ)Known as the home of the world’s best Black tea, Darjeeling boasts 78 single Estate tea gardens. Many Estates date to the 1860s, though nowadays several large conglomerates own and operate six or ten Estate gardens each. Ambootia Group is one such conglomerate that runs their farms biodynamically. Traditionally Darjeeling raises Fine Tippy Golden Flowering Orange Pekoe, but nowadays they’ve diversified and grow all styles of tea. Nilgiri (நீலகிரி)Nilgiri is the Indian growing region that includes Tamil Nadu, the southern portion of the Western Ghats, and parts of Kerala state. Like Darjeeling, most production is small holder farms, with only about 30% from plantations. Nilgiri makes up more than half of all South Indian production, 50% of which is exported. Although most Nilgiri tea is CTC, their orthodox loose leaf has begun to attract attention, including Western retailers. Nilgiri is known for its highly aromatic dark teas. Sikkim (སུ་ཁྱིམ་)Sikkim, directly north of Darjeeling, is one of Indian tea’s best kept secrets. Although it only spans 2,700 square miles, Sikkim is part of the Himalayas and its elevation varies from 1,000 feet above sea level and climbs to 28,169 feet (Mount Kangchenjunga, the world’s 3rd highest peak). Sikkim is one of the only states in India that receives snowfall, so it will come as no surprise that Sikkim has all of one tea garden, Temi, in the Southern district. Temi, established in 1969, spans 440 acres, producing 100 tonnes of organic Black tea (only). Temi tea is broken into four grades: FTGFOP, Sikkim Solja, Mystique, Kanchanjunga as well as dusts. About 75% of all Temi tea is exported via auction in Kolkata. Kagoshima (鹿児島)The Nishi family farm in the volcanic, nutrient-rich soils of Kagoshima Prefecture in southern Japan is home to some of the finest Senchas and Gyokuros. Nagano (長野)Nagano is too far north to grow tea, but they do produce some incredible herbal tisanes (and osake!). Shizuoka (静岡)Shizuoka produces 40% of the raw tea leaf in Japan. Varieties such as Motoyama and Yabukita are grown in all corners of the city, and the varieties grown especially in the Warashina area in Aoi Ward and the Ryōgōchi area of Shimizu Ward are known for being high quality. Uji (宇治)Officially a part of Kyoto, Uji is actually shared between four prefectures (Shiga, Nara, Kyoto, and Mie) as it dates back to the dawn of the Edo. Yame (八女)Yame, in Fukuoka Prefecture, is said to be one of the two best tea growing regions in Japan. Dimbula (මාතලේ)Dimbula, part of the province of Matale, was originally covered by a dense jungle of tropical forests. Tea garden elevations in Dimbula range from 3,300 to 5,600 feet and produce mid-to-lower high grown teas. Dimbula produces teas with a well-rounded “Ceylon” character, often used as components in CTC blends. Dimbula’s most famous garden is probably Kirkoswald, but my favorite is Bogahawatte (which is certified Fair Trade). Kandy (මහ)The second largest city on Sri Lanka after its capital Colombo, Kandy is the birthplace of Ceylon tea production. Compared to other Sri Lankan tea producing regions, Kandy is warmer with lower altitudes. The best teas from Kandy are harvested at their driest: December through March. Probably the most famous Kandy garden in the West is Kenilworth Estate, which produces many notable OPs and BOPs. Matara (මාතර)Matara is the Southern-most tea producing region in Sri Lanka. Like its other cousins, Matara is also visited by high amounts of rainfall ideal for growing tea. Lumbini Estate, Matara’s most popular tea garden, is a family owned farm est. in 1984. Since then, Lumbini Estate has been awarded many times for outstanding tea and industry work (including sustainable farming practices). I’ve run across their teas distributed from a couple of different vendors here in the States. Nuwara Eliya (නුවර එළිය)Nuwara Eliya, the Southern of the central three Sri Lankan tea growing regions, boasts the country’s highest grown teas. As such, Nuwara Eliya is also cooler, with frost occurring at its highest elevations (though it tends to have consistent humidity year round). Nuwara Eliya doesn’t contribute much to the total Sri Lankan output, but thanks to its elevation its teas probably have the most character. Nuwara Eliya’s most famous tea garden is probably Lovers Leap (near the famous cliff of the same name). Ratnapura (රත්නපුර)Ratnapura is easily one of the most obscure tea producing regions. Located in the South interior of Sri Lanka, bordering its more famous tea producing cousins, Ratnapura could be easily forgotten. Lying in a lower elevation in a transitional climate zone between hills and plains (usually less than 2,000 ft above sea level), Ratnapura produces rougher, more robust teas. Ratnapura’s best known teas are probably those from the Pilapitiya family’s New Vithanakande Estate. Uva (ඌව)The second-least populated province in Sri Lanka, Uva has tea plantations that vary in altitude from 3,300 to 5,600 feet above sea level (thus producing some high grown tea). Uva receives a great deal of rain in the winter with harsh winds in summer, which in turn endows its tea with a very unique style. Probably the most popular Uva tea in the West are Greens produced from several gardens in and surrounding Idulgashinna. Taiwan (民國)Though no longer referred to as “Formosa”, Taiwanese teas are still highly respected for their character. Taiwanese Oolongs (especially Pouchoungs, Alishan and Tung Ting) are the most popular. Korea (대한민국)With more than a 1,000 years of tea culture, Korea’s humid air, monsoons and strong winds (especially on Jeju Island) are ideal for growing tea. Korea grows mostly uniquely strong Greens. Nepal (नेपाल)Though Nepal is a small country, it’s location in the Himalayas is perfect for tea husbandry. The high altitudes, seasonal monsoons and diverse topography help produce many of the best teas available in the West. Tippy Nepal Blacks are probably the best there are. South East Asia (Asia Tenggara)Vietnam, Thailand and Indonesia produce many interest teas. Java boasts several fascinating styles by itself. Tea isn’t a major export of this region, but production is slowly growing. OceaniaCurrently, the most prominent growing region in Oceania is Hawaii. South America (América do Sul)Apart from Brazil’s sencha-style Greens, South America does not produce much tea. Yet, a great many of the best tisanes are grown throughout the continent and enjoyed the world over. Central America (Centroamérica)Although Los Andes estate in Guatemala does produce some tea, it’s barely negligible on the market. Mexico and Costa Rica do export some really fabulous herbs used in tisanes. North America (‘Maerika)Apart from Charleston, you’ll be hard pressed to find tea grown in this desolate wasteland. They do have some subpar-to-okay herbal tisanes and kombucha if you look hard enough. Africa (أفريقيا)Although you might not think of it, Africa is hugely important to global tea production. Exports of Kenya’s Whites and Blacks contribute to 4% of its total GDP. Tanzania’s Chai Bora and Malawi’s Mulanje Mountain are both significant growers. Southern Africa (Kusini mwa Afrika)South Africa is home to the immensely popular Rooibos and Honeybush herbs, used in almost half of all flavored teas in the West. Europe (L’Europe)Turkey is the major player here, both as a producer and as a consumer. The fifth largest tea producer in 2007, Turkish Blacks and CTC Earl Grey are somewhat famous. The real deal isn’t exported too far though, as the only vendor i recognize from this region is Palais des Thés. Georgia is an up and coming tea producer. Nearby Sochi, Russia also produces some hardy teas. Organic U•Matcha Single Sips (Republic of Tea) ~ packaging by Jocilyn Mors is licensed under a Creative Commons Attribution-NonCommercial-ShareAlike 4.0 International License. Apparently Americans can’t be bothered to buy bottled iced green teas baring inscrutable Japanese catchphrases. They need an iced green tea they can make by simply dumping powder from a throwaway wrapper into their Nestle bottled water, whitewashing millennia-old matcha culture into a trendy new diet. It’s many health benefits not withstanding, the best thing about matcha is its taste. Even Mary Berry of The Great British Baking craze called it “distinctly very grassy”. Well, with Organic U•Matcha® Single Sips® Republic of Tea has attempted to bring the umami (and apparently the interpunct) to iced tea. Naturally, being a product marketed to North Americans, the actual makeup is nothing like matcha. In fact, Republic has haphazardly added organic agave inulin and “natural flavor” to their take on this, the most painstakingly produced and distinctive terroir of all teas. Thankfully the agave isn’t overly noticeable, but its unclear exactly why they chose to use agave. Stevia is after all the hip new anti-sugar that at least would have had the virtue of being plant-like. My best guess? Like honey, agave is also quite gassy and may have the added benefit of declumping the wet matcha powder to some extent. Another more likely reason stems from the fact that Republic needed to use an inulin sweetener to get the matcha powder to crystallize and adequately infuse to room-temperature bottled water ala Crystal Light or freeze-dried Lipton. 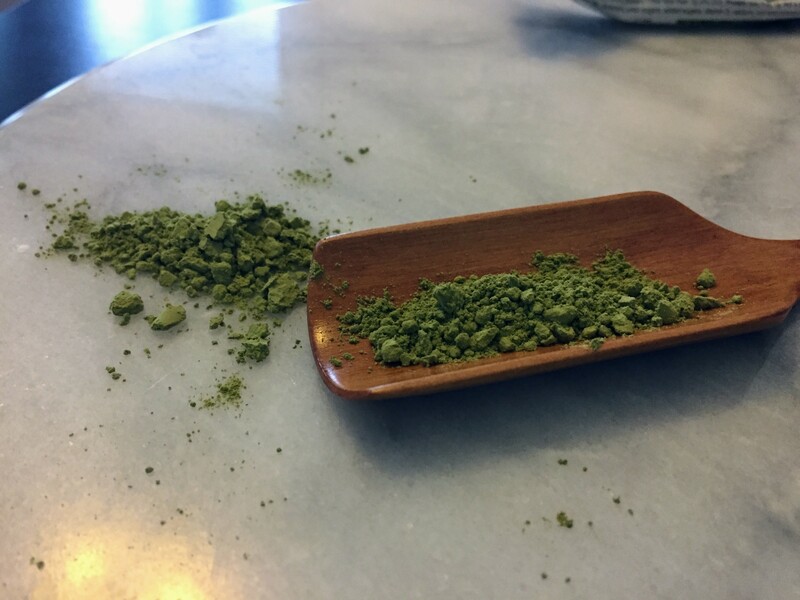 That being said, the resulting matcha powder is a partially crystallized cooking grade, which is to say dense and cheap (and marketable by comparison to Premium and Ceremonial grades). U•Matcha’s consistency is reminiscent of what a well-whisked frothy, uber grit matcha ought to be, without really doing much of the work. A green so dark, Kermit would be jealous, the liquor is kind of a dirty toad green? Like any tea, its flavor will be assisted or inhibited by the quality of the water in solution. In this case I’m using rare and posh 1907 naturally alkaline Aucklandian ancient artesian aqua in order to really give it the benefit of the doubt (doubtless far and away outstripping what Republic’s target audience will be using). In aroma, U•Matcha has a Southern Plains States uncut lawn appeal; the aroma doesn’t really remind me of sencha, though is somehow still attractive. As, surprise surprise, U•Matcha requires a great deal of shaking to infuse correctly, it will have a bubbly head to deal with for many minutes of its peak drinking time (unfortunately adding to the difficulty in judging this monstrosity of a tea). In texture, U•Matcha is disappointingly medium grit with a coating mouthfeel that will have you running to brush your teeth. The flavor is matcha… which is to say it is the Americanized “matcha-flavored” ice cream or chocolate cake adulterated wannabe umami; as unlike its subtle bitter namesake as Hot and Sour soup. As an iced tea, U•Matcha is probably a wildly successful top of the line product. As a matcha, “laughable imitation” is too high praise. I did try reheating U•Matcha to a regular matcha temperature, but sadly the results were painfully undrinkable. That in itself doesn’t come as much of a surprise: in my experience, if it’s designed to be an iced tea, that’s usually all it can ever be. Although U•Matcha ought to come across as another wake-up-screaming cultural appropriation nightmare (I’ve often thought there was something unsettlingly colonial about the name “Republic of Tea”…), i come away with a feeling more akin to an eye rolling “Buh”. After all, the former would require it to actually resemble the original in some fundamental way. Organic U•Matcha Single Sips (Republic of Tea) ~ loose leaf by Jocilyn Mors is licensed under a Creative Commons Attribution-NonCommercial-ShareAlike 4.0 International License. Organic U•Matcha Single Sips (Republic of Tea) ~ LL Macro 14X by Jocilyn Mors is licensed under a Creative Commons Attribution-NonCommercial-ShareAlike 4.0 International License. Organic U•Matcha Single Sips (Republic of Tea) ~ LL Macro 21X by Jocilyn Mors is licensed under a Creative Commons Attribution-NonCommercial-ShareAlike 4.0 International License. Organic U•Matcha Single Sips (Republic of Tea) ~ kitty litter comparison by Jocilyn Mors is licensed under a Creative Commons Attribution-NonCommercial-ShareAlike 4.0 International License. Organic U•Matcha Single Sips (Republic of Tea) ~ liquor by Jocilyn Mors is licensed under a Creative Commons Attribution-NonCommercial-ShareAlike 4.0 International License. Organic U•Matcha Single Sips (Republic of Tea) ~ liquor colour comparison by Jocilyn Mors is licensed under a Creative Commons Attribution-NonCommercial-ShareAlike 4.0 International License.